A rod of pure copper is used as a cathode and the impure copper is an anode. The electrolyte (solution the ions travel through) is a solution of copper (II) sulphate (CUSO4). 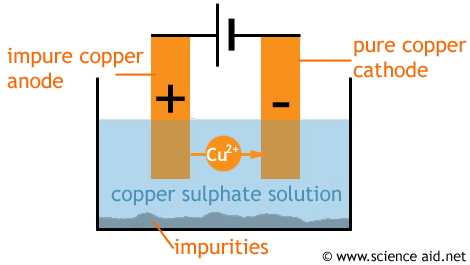 During electrolysis, copper (II) ions leave the impure copper anode and since they are positive are attracted to the negative cathode - here they pick up the two electrons that are needed to form a copper metal and this builds up pure copper. Impurities from the anode collect at the bottom of the solution.